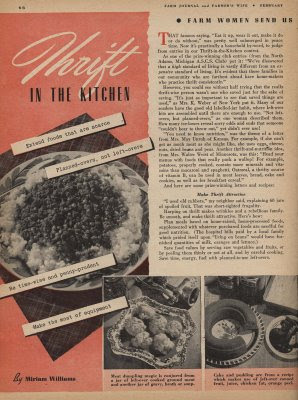 Thrift in the kitchen, tips & recipes from readers published in the Farm Journal and Farmer's Wife Magazine (February, 1943). This column makes me smile. My grandmother WAS, in fact, a farmer's wife. Thank you for scanning this article. I read it with great enthusiasm! I finally faced the fact (back a few months ago) that my pantry was full but I wasn't cooking. When I did cook, things would always go to waste. 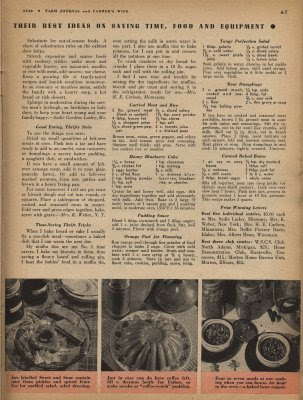 I really enjoy reading these kinds of articles, cookbooks, etc. So full of good advice. Thank you for posting it.